In Quadrant‘s April edition, reviewer Oliver Friendship addresses Sir Roger Scruton’s recent collection of short stories, Souls in the Twilight, observing that the conservative thinker’s fictions are all the more valuable for being at odds with the politically correct strictures that hobble the imaginations and output of so many writers less keen on telling stories than courting favour with the modern literary scene’s doctrinaire arbiters. … It was obvious from the first that his appointment was a wound to the predominant faction of the British intelligentsia that could be healed only by his dismissal. The sheer hideousness of most of what has been built in Britain over the last few decades (so immediately apparent that only an intellectual could miss it) was no excuse for having allowed Scruton to sully the corridors of power even for a few months. In the great work of ridding the body politic of the stone in its shoe or the thorn in its flesh, any slur would do, any libel or slander that came to mind was perfectly acceptable. The feeling when you get right-wing racist and homophobe Roger Scruton sacked as a Tory government adviser. In the interest of fairness, it should be noted that Eaton denies being anything but a principled and upstanding chronicler of straight-bat truth. Why, he’s shocked — yes, shocked! — that anyone might suspect him of spreading thick the slime and slurs to bring down a man whose conservative philosophy he disdains. Eaton’s defence of the hatchet’s place in architectural criticism can be read in full here. 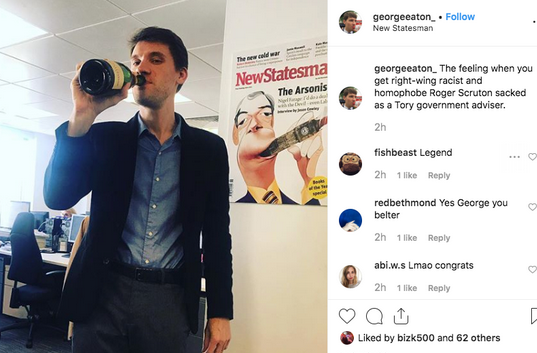 UPDATE: ‘We’ve lost, I’m afraid’ — below, Paul Weston on the lynching of a giant, Roger Scruton, by the ‘pygmy Left’ and, far more distressing, his abandonment by those who should have been his champions. We are looking at (still) a Pavlovian response conditioned over some years by way of a holier than thou version if morality that compels it victims (carriers) to accept any expression of disfavour expressed by its proponent (practitioners). How else can one explain the instantaneous acceptance of and revulsion from people in the media to a tissue of lies – people who should know better (and generally do). The idea of a right to free expression has been perverted to such an extent that it has been turned into a sword to be used to attack and dismember (at the very least) anyone who dares to express a view outside the mainstream of the virtuous. Nothing Scruton actually said could be described as misguided, wrong, objectionable, or harmful to any person, but so many jumped in response to a false claim without any question of its veracity we must surely worry for the future of our society and the well-being of our children.